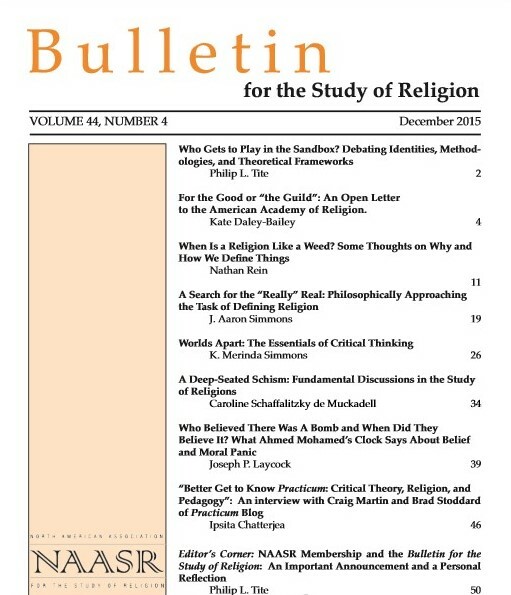 The following is the editorial introduction to the December 2015 issue of the Bulletin for the Study of Religion (the full table of contents having already been posted). We offer this editorial here on the blog in order to give readers an overview of the most recent issue of the Bulletin. Every teacher in the field of religious studies is familiar with the “first-day ritual” of throwing up a series of definitions on the blackboard or, these days, on Power Point slides in response to the perennial (and for many exhausting) question: What is “religion”? The same is true of nearly every introductory textbook that is—and has been—on the market for such courses as World Religions, Introduction to Religion, or Theories in the Study of Religion. More often than not, such books and teachers will present a selection of standard definitions of religion, commonly including those from Müller, James, Otto, Freud, Tillich, and Cantwell Smith along with several others drawn from more recent attempts at defining this enigmatic term. Occasionally, these definitions may be arranged typologically—for example, as essentialist, functionalist, and “family resemblance” definitions (see, for example, McCutcheon 2005). Once students are presented with the “problem,” they are inevitably given a “solution”—albeit a heuristic solution that strives to encompass several positive features from the variety of contending definitions. The task is to find something “that works.” With such a definition in play, the course can then proceed to the real goal of instruction, i.e., the study of religion and religious traditions. In my own course on Theories in the Study of Religion, I also begin with the definitional problem, though with a slightly different angle. Rather than resolving the problem (i.e., to come to a useful tool for studying the range of traditions that comprise the data of our field), we continually return to the construction of definitions of religion. Our goal is not to establish a working definition, but rather to explore the social and ideological influences shaping and directing our theorists’ constructive processes for such definitions. Given the historical emphasis in my course design, our study of theory is more a history of ideas or sociology of knowledge focused upon the field of religious studies—specifically comparative religion—as our data set. What emerges is that each definition of religion tells us more about the theorist than about what the theorist is studying. How one defines “religion,” as well as how one even approaches the act of defining, is an act of creating an academic discipline, of establishing the object of study along with the analytical contours deemed appropriate (and inappropriate) for such analysis. By defining, we get to determine who’s in and who’s out in the study of religion—and the “who” in question includes not only religious practitioners but also those claiming scholarly expertise. Who gets to play in our sandbox is determined by such discursive acts of definition. Prior to our exchange over essentialist definitions of religion, we open this issue with an Open Letter from Kate Daley-Bailey to the American Academy of Religion on the shifting trends and difficulties faced by the growth in “adjunctification,”especially within the humanities and social sciences. Once again, we are looking at the shape and direction of our discipline, in this case with an eye toward the profession of—and not just theorization within—religious studies. Daley-Bailey’s concerns over the annual meeting raise serious questions about the power dynamics involved in our profession. Twenty years ago, to be an adjunct or contingent faculty member was a mark of transition (moving from doctoral student status to tenure-track faculty status, often seen as “paying one’s dues” or a process of “apprenticeship”), a temporary crisis (a “bump” in the career), or a mark of failure on the part of the scholar (though never on the part of the institution), i.e., candidates typically had four years to “land” the job and if they were unsuccessful, then obviously something was wrong with them. As many now recognize, there has been a major transformation in the profession, where over 70 percent of higher education instruction in North America is done by adjunct or contingent faculty. For many scholars facing the job market over the past fifteen years, adjunct teaching (p/t or f/t; at one institution or spread out over several) has become “the career,” indeed the only career option many of us have despite degrees, publications, classroom successes, academic reputations, etc. Daley-Bailey’s disturbing and thought-provoking letter to the AAR calls for a constructive dialogue over how our major professional body has (inadequately, many would say) responded to these shifts. Access to resources— financial, employment security, research material, and social capital—differ between tenured, tenure track faculty, and contingent faculty. Again, we encounter power dynamics at play in the very shaping of our field. It is my hope that by publishing this Open Letter, much needed discussions over these issues will be sparked along constructive lines. In addition to these pieces, we are pleased to include three further works. Joe Laycock, building on his Bulletin blog post, offers an engaging analysis of the recent controversy in Irving, Texas over Ahmed Mohamed’s homemade clock, which was treated by high school officials as a bomb threat. Laycock analyzes the interplay of action and belief within the epistemological “messiness” exemplified by this case study. We are also pleased to include an interview conducted by Ipsita Chatterjea with the editors of the Practicum blog (Brad Stoddard and Craig Martin). Finally, we close with another installment of the “Editor’s Corner,” this time announcing and commenting on an exciting new subscription development between the Bulletin and NAASR members. McCutcheon, Russell T. 2005. “What is Religion?” In Introduction to World Religions. Edited by Christopher Partridge, 10-13. Minneapolis: Fortress. Schaffalitzky de Muckadell, Caroline. 2014. “On Essentialism and Real Definitions of Religion.” Journal of the American Academy of Religion 82.2: 495-520. http://dx.doi.org/10.1093/jaarel/lfu015. This entry was posted in Announcements, Craig Martin, Editorial, Interviews, Ipsita Chatterjea, Joseph Laycock, Kate Daley-Bailey, Nathan Rein, Pedagogy, Philip L. Tite, Religion and Society, Religion and Theory, Religion in the News, Theory and Method, Theory in the Real World and tagged AAR, adjunctification, Adjuncts, Ahmed Mohamed, American Academy of Religion, american religion, and Pedagogy, Annual Meeting, Brad Stoddard, Bulletin for the Study of Religion, Caroline Schaffalitzky de Muckadell, Craig Martin, definitions, Definitions of Religion, J. Aaron Simmons, JAAR, Joseph Laycock, Journal of the American Academy of Religion, K. Merinda Simmons, NAASR, Nathan Rein, North American Association for the Study of Religion, Open Letter, pedagogy, Practicum, Religion, religious studies, Russell McCutcheon, teaching. Bookmark the permalink.